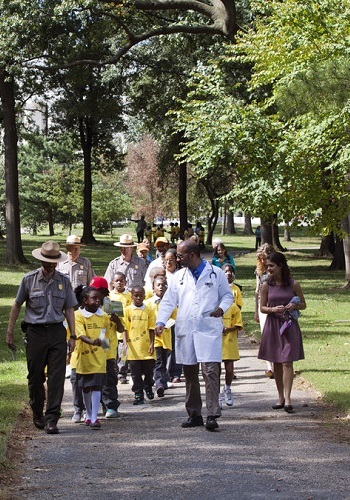 Pediatricians in Washington, D.C. are prescribing their patients a new type of medicine: parks. Presenting on the success of DC Park RX, a new community health initiative, at a conference organized by Casey Trees, Dr. Robert Zarr, the founder and director of the program, said that many doctors have started to recognize the positive impact nature has on many health conditions. “Nature clearly shows an effect on your health in terms of prevention. So you may not have a diagnosis yet, but if you’re headed that way, you can certainly turn that around by spending more time outside,” Zarr said. DC Park RX created a searchable online database of parks, identifying 350 green spaces in the district. Every park gets a one-page summary that makes it simple for both healthcare providers and patients to find a nearby park. “If a child was obese and really liked to play basketball, a doctor can very quickly go through the parks in the database in about 5 seconds, find a park with basketball courts, and print it out for them with directions for how to get there. They get the information to them right then and there,” Zarr said. Doctors are able to integrate the database right into their workflow with patients’ charts, just as they would any other prescription. Unity Health Care pediatrician María Rueda-González shows a patient a park near her home / Kate Patterson, The Washington Post. 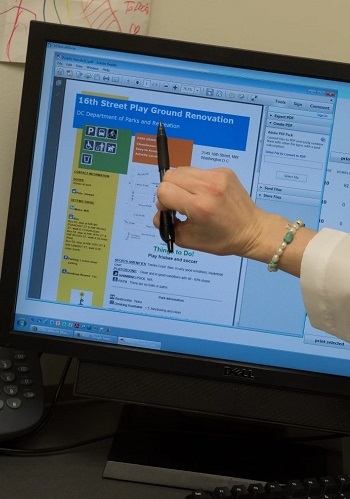 According to The Washington Post, it is hard to say how many people are currently using the public database, but at “Unity Health Care, which serves 100,000 District residents, 180 providers with access to the system have made 720 prescriptions.” Zarr said that preliminary data indicates that children who have been prescribed time in the park are getting an additional 22 minutes per week of physical activity, and are spending 6 more days per year at a park for at least 30 minutes, results he finds encouraging for such a small program. Parks are now being recognized as critical to medically treating chronic disease. “100 million Americans suffer from chronic disease and being overweight or obese contributes to chronic disease. Chronic disease results in decreased quality of life and ultimately in premature death, but spending time in a natural environment increases physical activity, hence decreasing the risk of obesity and chronic disease,” Zarr said. Dr. Robert Zarr leads a hike through a park in Washington, D.C. Though Park Rx is one of the first programs to give doctors a tool to prescribe parks, the idea that doing physical activity in nature offers health benefits is hardly new. Many studies have now made the connection. For example, research published in the American Journal of Preventative Medicine in 2008 indicated that children who are active outdoors are less prone to obesity than their peers who spend hours inside in front of their TVs and computers. However, Zarr noted that he doesn’t expect parks to be the cure for every patient. “Sometimes a patient just isn’t there yet,” he said. “We don’t prescribe a park to every patient, but when they are ready we will.” For patients suffering from chronic disease, or are on the verge of developing a chronic disease, prescribing increased access to nature as part of an integrated treatment plan poses few risks and offers plenty of benefits. Zarr is currently trying to find a way to expand DC Park Rx across the entire city and improve the functionality of the database to make it more like “Yelp for parks.” He has also been given the go ahead to further research and compile the biometric data he is accumulating, which will hopefully indicate a link between patients who have been prescribed parks and a decrease in their Body mass indexes (BMIs), blood pressure, and symptoms of depression. And with a stronger base of evidence for the health benefits of nature, it is only a matter of time before more doctors add to their prescription pads an Rx for outdoor activity.